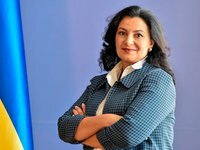 Ukraine's Deputy Prime Minister for European and Euro-Atlantic Integration Ivanna Klympush-Tsintsadze has said Russian special services are actively trying to discredit Ukrainian patriots by branding them anti-Semitic. "We have serious threats that do not always come from Ukrainian roots [...] The threats to our partnership that we see are, in particular, the effective use by the Russian special services of the so-called 'Jewish card' in Ukraine and attempts to equate between Ukrainian patriots and anti-Semites," she said at a conference, dubbed "The Experience of the State of Israel: Lessons for Ukraine," held on Tuesday in Kyiv. According to her, even the Soviet special services did the same then. "And now, with renewed vigor, attempts have been made to discredit the movement for independence in Ukraine," Klympush-Tsintsadze said. "I do not want to say that there is no such problem at all. It would be irresponsible, but we are discussing those cases of vandalism or attacks in Ukraine and doing everything we can to effectively investigate and prevent new cases like this," she said. Klympush-Tsintsadze stressed that during 2017 there were no recorded cases of violence against the Jewish community.